Builders Club is a student-led service organization for middle school students dedicated to school and community service. The St. Clare Walker Builders Club includes fifty students from all three middle school grades. Any student interested in service and of good character is eligible to join. Kiwanis International, a worldwide service organization whose clubs serve children and develop youth leadership, sponsors the Builders Club. Its purpose is to develop leadership through service. The students at SCW participate in a variety of service activities. One of the most popular is Book Buddies. 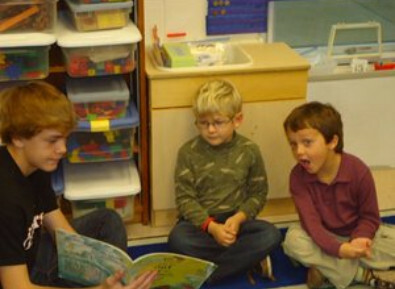 Twice a month, students walk from SCW to MES to read to the elementary school students. This takes place during the LASER period from 8:15-8:40. Another project involves the Kiwanis Club and the Oyster Festival. Students volunteer their time to serve customers at the Kiwanis food tent during the event. Although it is a long day and hard work, it is a fun time for the students. By handling part of the workload, the students allow the Kiwanis members to further enjoy the festival as well. Within school, the Builders Club sponsors many events to raise money for charitable causes. Hat Day allows students to wear a hat during the school day when they donate $2 to the Cystic Fibrosis Foundation. Movie night and other activities raise money for Relay For Life and the American Cancer Society. Candy sales and other events also add to the club’s charitable giving. Builders Club fosters an attitude of service and leadership skills within its members. These students are being prepared for life beyond middle school as caring citizens and strong leaders for our community.